John A Lee was, amongst other things, a war hero, politician, publican and author during his unusually eventful and varied life. In his will Lee asked that his private papers be deposited with Auckland Libraries a year after his death. Recently described by John Horrocks in the Journal of New Zealand literature (2016; Vol. 34 (1)) as a “vast and chaotic archive”, researchers will be pleased to hear that a project is underway to undertake fuller arrangement and description of this collection, thanks to support provided by the Auckland Library Heritage Trust. 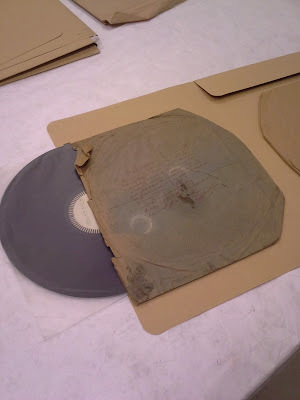 Lee’s papers came to the library in a staggered manner which leads to challenges for the archivist trying to follow archival concepts of provenance and original order. At the end of this project we will have a rich finding aid for Lee’s papers which will make it easier for future researchers to find and use them. Ref: Record. 1936. From: John A Lee. Papers. NZMS 828. Whilst this work is ongoing it provides an opportunity to highlight some of the things that make up this collection. Lee’s varied life is reflected in the variety of formats that make up this collection. 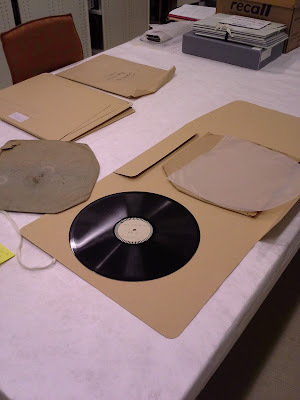 As well as diaries, letters, manuscripts of his writing, photographs and scrapbooks Lee also donated gramophone records. These are not commercial records he’d purchased but self-recorded ones. Lee’s papers contain copious annotations in red ballpoint irrespective of the format of the material. His note on the sleeve here describes how the record came to be during a walk through central Wellington with his friend Colin Scrimgeour (Scrim). Passing Begg’s Scrim says come in and make a record. There is a new marvel to be tested. I record on a disc that can be broadcast over Friendly Road or any other station. I start to repeat some war poetry. The day of the tape recorder has not yet arrived. Lee was uniquely qualified to walk in off the street and give a brief, moving talk on war poetry. He enlisted in the New Zealand Expeditionary Force in March 1916 and was awarded a Distinguished Conduct Medal in June 1917 for single-handedly capturing a German machine-gun post in the Battle of Messines. A wound at Mailly-Maillet in March 1918 resulted in the loss of his left arm. 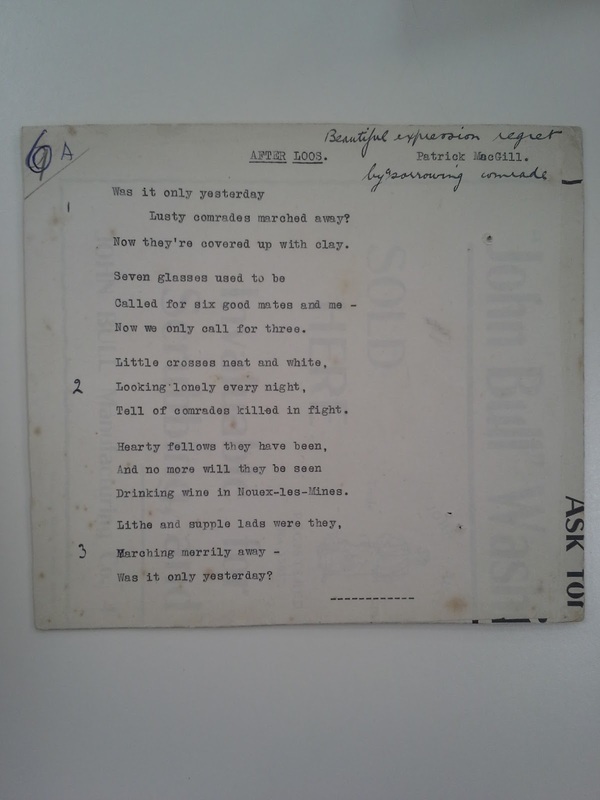 Lee also gave formal radio talks on war poetry and his note cards for one such talk are also included in his papers. 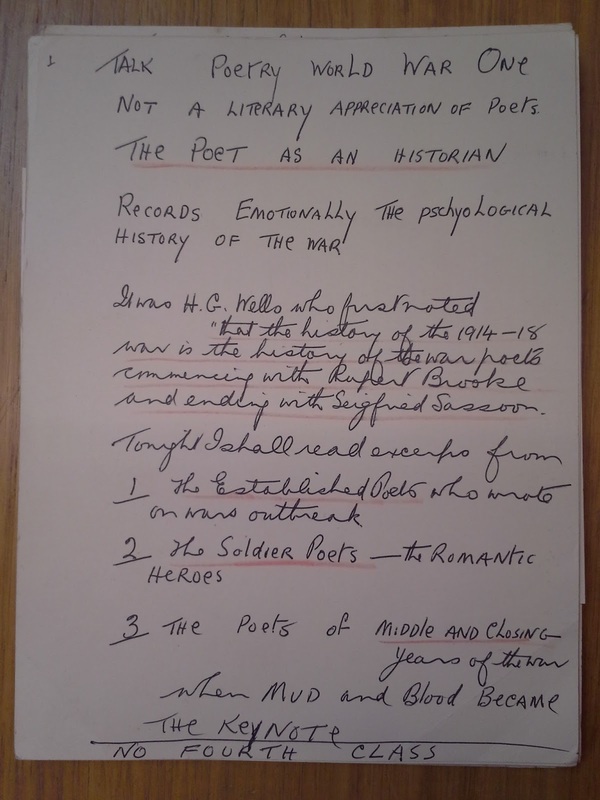 Here is the introductory card for one of his talks where he focuses on the poets of the war as historians who record the emotional and psychological history of the war. The poets Lee recites on the record are all from what Lee classified as the middle and closing years of the war ‘when mud and blood became the keynote’. Ref: Note card. From: John A Lee. Papers. NZMS 828. Lee was known as a charismatic orator and his oratorial skills are apparent in the talk, not just when reciting verse but in his observations and in the interludes between the poems. Listening to this talk and comparing the verses Lee quotes to the canonical versions of the poems it is obvious that he’s doing it off the top of his head, which is rather impressive. Lee notes that soldiers very rarely found humour in the poetry of the First World War but that “the most tragic of all war poets” Siegfried Sassoon does succeed in striking a satirical note in ‘The General’. 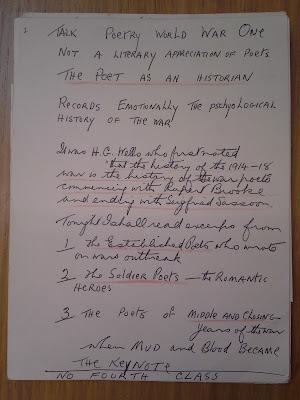 Lee says most of the poetry that comes from soldiers in the war is characterised by the haunting regret at departed comrades or of the bitterness of disillusionment itself. Lee then recites, ‘After Loos’, which he describes as a beautiful haunting regret by Patrick MacGill as he’s drinking his glass of wine thinking of comrades who have disappeared in the barrage. MacGill’s life and career share remarkable similarities with Lee’s including writing similarly titled novels about the exploitation of the working classes, Children of the dead-end and Children of the poor. 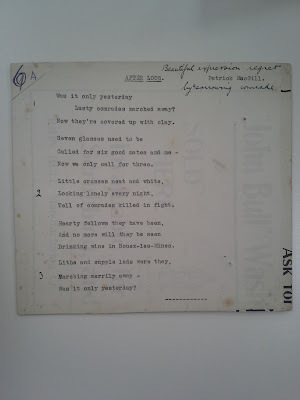 It is interesting that he was equally comfortable reciting MacGill’s war poetry as well as the more famous work of Sassoon and Squire. Ref: 'After Loos' note card. From: John A Lee. Papers. NZMS 828. Answering MacGill’s refrain, ‘Was it only yesterday?’ Lee makes a poignant observation about how much of the lives of the soldiers the War takes up. This was surely the case for a generation of men and their families when they returned. As further work is completed we look forward to bringing you more unique and interesting items from Lee’s papers.